Previous to this past weekend, the closest I had been to camping was a weekend spent lounging in a very spacious Marfa teepee, inclusive of linen service and in-tent electrical outlets. 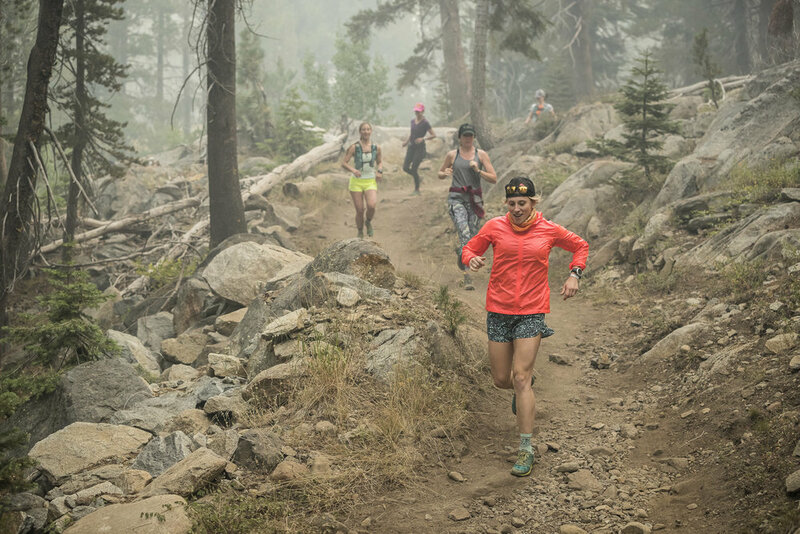 Sleeping on the ground, without access to flush toilets, nightlights or even one bar of cell service was something I thought that only endurance athletes in the middle of an ultra marathon and Cheryl Strayed could do. But as a lover of active travel and wellness challenges, and a reader of the studies showing that ‘forest bathing’ can decrease both anxiety and heart rate, I thought it about time to send myself out into the woods for some functional fitness and and a mental health upgrade. So I signed up for The Outbound Collective's Pursuit Series, a weekend crash course in the outdoors, presented in the style of an adult sleep-away camp. The program combines backcountry fitness, wilderness preparedness coursework, ways to fine tune an already outdoors-y lifestyle and nightly, boozy bonfires with new friends. To Pursuit, I brought a fair share of necessary and not so necessary gear with me, as I really had no idea what the weekend would call for, despite a thorough checklist for core recommendations provided by the organizers. Much of what I brought I didn’t need (a flatiron, foundation) and some I was so grateful to have (nail file). I’m not including the major basics here like tents and sleeping bags, as I’ll leave those recommendations to the real outdoor experts, or the obvious needs even to us indoor gals like SPF and water bottles, but as a now non-virgin camper, here are the less-than-obvious tools that I found to be most useful for a weekend under the sun and stars. I wasn’t willing to go full backpacker, but I also knew better than to bring a roller bag that wouldn’t survive five Teva-d steps before injuring a wheel. So I brought along BABOON’s new adventurer-meets-fashion three-day duffel. In white - which surprisingly stayed that way. It did everything it needed to and was the prettiest pack on the campsite. I brought a wide-brimmed bohemian cowboy style hat from Tenth Street Hats that both protected me from the sun and disguised my sweaty, not exactly blow-dried locks. I was so proud of my foresight until I found myself on a stand up paddle-board, in the middle of a lake, with a light wind that blew it right off. Recommendation? Remember to bring a wide-brimmed hat with a chin strap. I didn’t think about what the nighttime face washing routine would look like on a campsite with Port-a-Potties and outdoor hand-washing stations. The first night I tried to do a full cleanse, moisturize, retinoid routine at the hand-washing sinks and realized what an amateur move it was while juggling everything on the way back to my tent. Makeup wipes can replace a traditional routine for a few nights, and can be done right in the privacy of your own tent. And while any wipe should do the trick, if you’re in need of some pampering reassurance while struggling to remove makeup in the dark, inside of a sleeping bag, Decorté’s new wipes are an excellent splurge for a momentary sense of luxury. Turns out there is a perfect ratio of wool to manmade fabrics for hiking and biking in the woods. Wigwam’s Ultimax socks kept my feet cushioned, dry, not too cramped and did not quit after three days of constant use. DryBar’s travel-sized Triple Sec works just as hard in humid city environments as when you’re stuck without your daily wash and blow routine. The miniature three ounce version was a go-to to for sprucing up hair for dinner after it had been flattened by rock climbing helmets or matted by lake diving. Luckily I made a new friend who had a spare from Cotopaxi, but now I know to bring a headlamp for everything at night. Campsites of course have no lighting, so having a personal source is handy for any evening activities, like the evening hikes and mountain bike rides we did at Pursuit, and handiest for bathroom runs in the middle of the night. Forty-five degree mornings were spent wrapped in a puffy jacket, but by noon I was sweating underneath SPF-protective fitness gear. I must have added and removed layers at least four times per day. Three long sleeve layers in the morning and a heavy duty Igloo mug filled with hot coffee made the morning, while lightweight and sweat-wicking fabrics with added sun-blocking coatings made the afternoons. Nights were spent in breathable linens or high necked zip ups bundled under a wool or puffy jacket. Having enough of the right layers made the elements a pleasure to soak up. Without fixed bathrooms or any permanent structures, there were no mirrors. I managed to toss in an old, broken compact mirror just ‘in case’ and it was the only way to discover how much dirt had mixed with frequent SPF applications to thoroughly cake itself onto my forehead, and chin and neck. 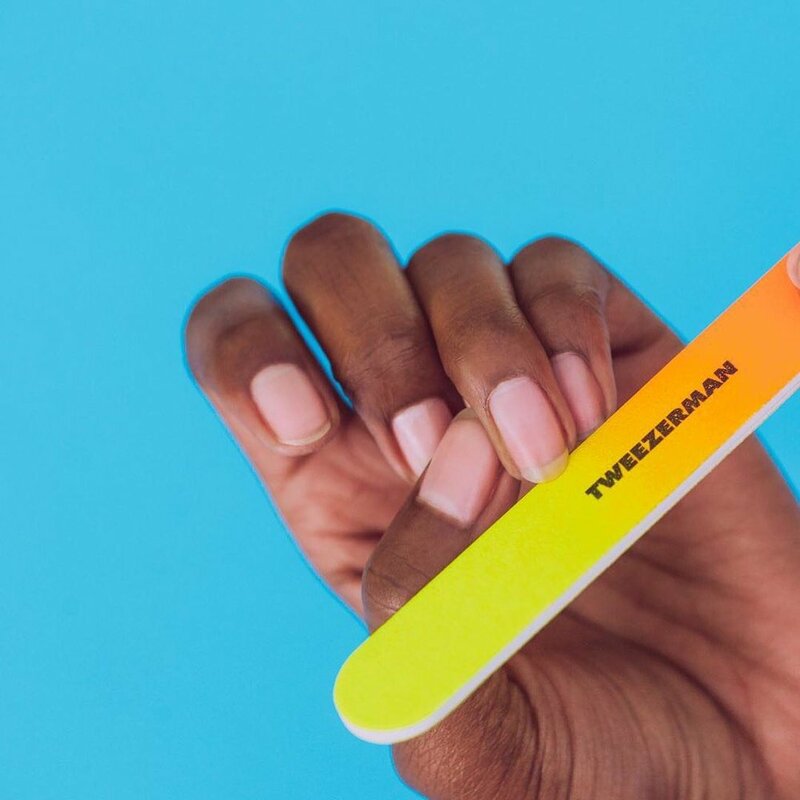 I was surprised to learn that a miniature nail file from Tweezerman was a daily go-to. Each day at Pursuit’s adult camp was spent rock climbing, mountain biking, trail running and just generally running around assaulting my manicure on various dusty mountains. My nails became shredded in ways I had never seen, and the only thing standing between me and straight up claws was this two inch, neon file. I didn’t wear a stitch of makeup the entire weekend, and the options I brought with me were a little too pigmented for a camping appropriate version of the no makeup makeup look. Next time I’m going to leave the makeup bag at home and bring just one tube each of Glossier’s low key Lash Slick mascara and Haloscope highlighter to feel a touch put together in a way that can be done and undone in under 30 seconds, mirror optional. I don’t really know why, but each morning I woke up in my tent with chapped lips. Even after a thorough lip balm application, I was left with a shiny version of the same chapped discomfort. I remembered I packed a mini sugar lip scrub from Milk + Honey as a naive ‘maybe I’ll do a DIY spa night under the stars!’ that ended up being a lifesaver for getting a handle on regulating the dryness. No matter what you pack, you’re guaranteed to wake up each the morning to the glorious smells and sounds of the woods. But with a few little indoor gear tweaks, you can seamlessly transition from indoors-only to adventure-all-day without sacrificing indoor gal creature comforts.